Emergency crews today rescued a man who had a seizure while working 100 feet in the air. The man was atop of Lockheed Martin's "Cornfield Cruiser" facility on Centerton Road in Moorestown, Burlington County. He had to be lowered off the structure by a crane. 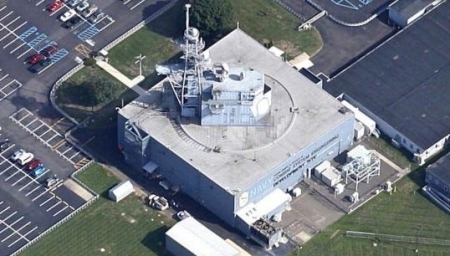 The facility is known to many because it looks like a battleship out in a field. It's actually called the Vice Admiral James H. Doyle Combat Systems Engineering Development Site. It was built in the 50's, according to Lockheed Martin, and owned by the Air Force. Now it is owned by the Navy and staffed with Navy and Lockheed personnel. An accident last night in Lower Merion, Montgomery County left two men dead and their car split in two. It happened at around 9:45 pm on Remington Road between Lancaster Ave and Haverford Rd. The two victims have been identified as Keith A. Phillips, 25, and Jhamiel Robinson, 22. Both lived in the 600 block of N. 65th Street in Philadelphia. They were driving a 2005 Acura TL before hitting a large tree. The force tore the car apart throwing them from the vehicle. It then went through a fence and into a stone wall. The two men were dead at the scene. Police say that 'excessive speed' was the cause. They did not say who was driving.